Preston and Rotherham will go into the second leg of their League One play-off semi-final on level terms after a fiercely-contested draw at Deepdale. Alex Revell put Rotherham in front, carrying the ball from the half-way line to slide the ball underneath goalkeeper Declan Rudd. But North End's top scorer Joe Garner equalised with a terrific 25-yard volley early in the second half. Neither got a winner leaving it finely poised going into the second leg. Preston have failed to win promotion in each of their eight previous play-off campaigns and could still end that miserable run after coming from behind to ensure a third draw between the two clubs this term. However, Simon Grayson's side had to recover from a poor first-half display as Rotherham, who are aiming to secure consecutive promotions, deservedly led at the interval. Joe Garner's spectacular strike was his 24th goal of the season and his first in five games. The Millers went in front through striker Revell, who turned his marker 50 yards from goal and enjoyed a free run into the penalty area before finishing coolly from close range. North End had scored 14 goals in their final three home games of the campaign but failed to create any meaningful opportunities until Garner's superb strike, his 24th of a prolific season for the Lilywhites, shortly after half-time. Rotherham, who were without their 25-goal top scorer Kieran Agard, almost restored their lead when Lee Frecklington was put through by Wes Thomas, but Rudd bravely denied him. Fellow midfielder Rob Milsom also went close for the visitors, firing wide from 18 yards. Both sides threatened late on, with Rudd forced into an excellent reflex save to keep out Haris Vuckic's header in stoppage time leaving the match level heading into Thursday's reverse fixture. "We always knew it was going to be a tough tie and a very tight affair. "I thought they were better than us in the first half. We didn't pass the ball well enough and like we can do. "I'm delighted that we're still in the tie. It's game on and there's plenty to play for." "The way he controlled it, flicked it over the lad and then hit it first time - the keeper didn't have a chance. "It was worthy of winning any game, never mind getting us back in the tie." "It has taken the goal of the century to break us. If there is a better goal in the play-offs this year then I'll wake up a chicken. But after that our keeper hasn't got a save to make. "We caused a good team real problems; when you break down their squad it really is quite scary what they have got. "We go level and if the second leg is like that it will be a fantastic game and now we have the opportunity for our fans to come and make as much noise as them. "It's an acceptable result, it's not a good result because we usually see that as winning but it is an acceptable one. I don't think it's advantage anyone, it gives us a chance but we know they have some top players. We know it will be extremely tough to beat them." Match ends, Preston North End 1, Rotherham United 1. Second Half ends, Preston North End 1, Rotherham United 1. Corner, Rotherham United. Conceded by Declan Rudd. Attempt saved. Haris Vuckic (Rotherham United) right footed shot from the right side of the six yard box is saved in the top right corner. Assisted by Kári Arnason with a headed pass. Foul by Chris Humphrey (Preston North End). Ben Pringle (Rotherham United) wins a free kick on the left wing. Claude Davis (Rotherham United) wins a free kick in the defensive half. Attempt missed. Paul Gallagher (Preston North End) right footed shot from outside the box misses to the left. Assisted by Kevin Davies with a headed pass. Corner, Preston North End. Conceded by Craig Morgan. Attempt blocked. Kevin Davies (Preston North End) left footed shot from outside the box is blocked. Assisted by Joe Garner. Attempt missed. 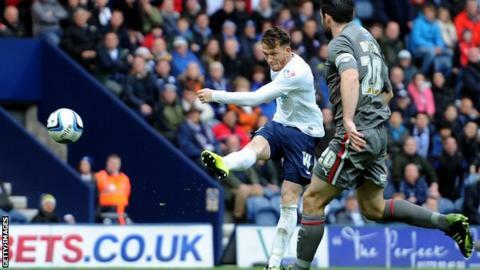 Joe Garner (Preston North End) header from the centre of the box misses to the right. Assisted by Paul Gallagher with a cross following a corner. Attempt missed. Joe Garner (Preston North End) right footed shot from outside the box is high and wide to the right following a set piece situation. Offside, Rotherham United. Kári Arnason tries a through ball, but Alex Revell is caught offside. Substitution, Preston North End. Chris Humphrey replaces Lee Holmes. John Welsh (Preston North End) is shown the yellow card. Attempt saved. Kári Arnason (Rotherham United) right footed shot from outside the box is saved in the centre of the goal. Assisted by Robert Milsom. Attempt missed. Paul Gallagher (Preston North End) right footed shot from outside the box is too high from a direct free kick. Kevin Davies (Preston North End) wins a free kick in the attacking half. Foul by Claude Davis (Rotherham United). Attempt missed. Wes Thomas (Rotherham United) header from the centre of the box is too high. Assisted by Kári Arnason with a cross. Foul by Lee Holmes (Preston North End). Michael O'Connor (Rotherham United) wins a free kick in the attacking half. Corner, Rotherham United. Conceded by Bailey Wright. Offside, Rotherham United. James Tavernier tries a through ball, but Wes Thomas is caught offside. Attempt missed. Robert Milsom (Rotherham United) left footed shot from outside the box misses to the left. Hand ball by Lee Holmes (Preston North End).